Nxabega Okavango Tented Camp is set in a private concession of 8 000 hectares (19 800 acres) to the southeast of the Moremi Wildlife Reserve in the centre of one of the most unique regions in the world, the Okavango Delta. Renowned for its lush waterways and abundant wildlife, the Okavango is home to a number of aquatic and land species. 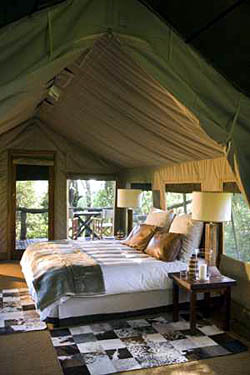 The Camp is known for its elegant tented accommodation with breathtaking views of the ever-changing Okavango Delta. Tucked under a canopy of massive ebony trees, Nxabega Okavango Tented Camp reveals the splendour and variety of the Okavango in all its glory. Sheltered by dense forest thickets, yet opening up onto wide, expansive views over lagoons and channels, the Camp showcases the best of what the Delta has to offer. 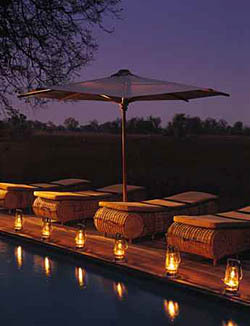 Nine exclusive tented suites are strung out on either side of the camp's handsome thatched guest areas.